Pesky neighbors, we're done asking nicely. 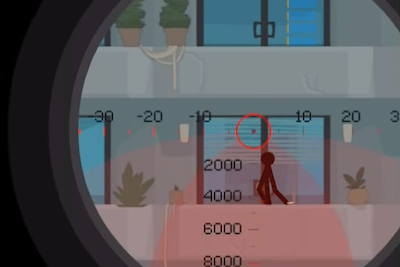 We're back with another round of mission walkthroughs for Clear Vision 3, the highly entertaining sniper shooting game where you're asked to take out specific stick figure targets for a big payday. Here's our latest step-by-step breakdown for missions 26 through 30. By this point, we recommend going with a high-powered rifle, like the Lock n' Load Baby, to get the job done. It'll compensate well for greater distances, as well as accuracy, and when the situation calls for it, wind. Someone isn't too fond of her neighbor's poor habits, so it's about time you did something about it. Here's the thing, though - when you begin the stage, you're looking out at the side of a building with three potential targets. Before you go firing like crazy, you'll receive a pair of hints - the target doesn't smoke, and they despise plants. 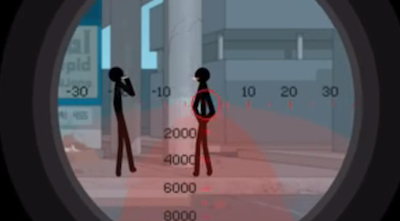 That means your mark is the bottom target, as he doesn't have plants around, nor a cigarette in his hand. Make sure you judge for distance (if you have an older rifle) and take him out. This next target is waiting at a bus stop, and apparently he has a case of the jitters, since he won't be able to sit down due to his sciatica nerve. When you first encounter him in the stage, he'll be on the right hand side, with his head behind a Bus Stop sign. 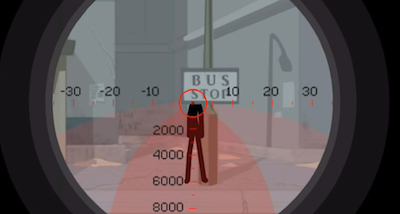 Don't let that concern you, just adjust your aim so that your sights are lined up right in the "S" in the word "Stop". (If you have an older rifle, you'll need to adjust further.) Once the "S" is in your sights, let loose with a bullet. It'll rip through the sign and take him out. Apparently, this guy has been pursued pretty much his whole life, and thought he would make a clean getaway in a cabin outside of town. That's not the case with you on the job. You'll find the guy cleaning up leaves on the side of the cabin, an ideal spot to take him out. This is a tough target, as you'll not only have to deal with -25 wind compensation, but also a great deal of distance. Plus, he's moving back and forth with his axe. 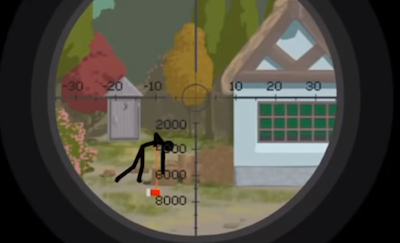 It's best to align your shot just a little bit above the brown leaf tree to the left of the cabin. Once you're at the top there, adjust to the -25 and distance markers, then, when he's coming back from chopping a piece of firewood, take the shot. Your client's business is losing customers, mainly due to some slobs that are hanging around outside. Your job is to take one of them out and scare the other off - you don't have to worry about picking them both off. Your best bet is the guy on the right, as he doesn't move much. Line up your shot and make sure you're pre-set for distance - take your time - then let him have it. The other guy will run like crazy, and business will be booming once more. 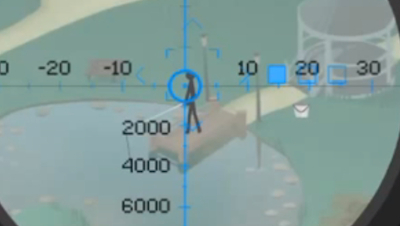 For our final walkthrough, we're taking on a target that spends most of his time fishing at a pond in the park. He's a good distance away, so with an older rifle, you'll need to adjust for wind compensation (about 5) and distance (about 2800). Newer rifles pose less of a problem, obviously. Once you get your scope lined up, wait for him to remain steady for a few seconds fishing on the dock - he'll occasionally turn around to throw something away - and make your shot count. If you're successful, he'll fall right into the water. Glub, glub.